McGriff has a powerful Hall of Fame case. He hit 493 home runs. He put up a 134 OPS+, which is excellent. He hit 30-plus homers 10 times — twice led the league — and he drove in 100-plus runs eight times. He would not be anywhere close to the worst player in the Hall of Fame. 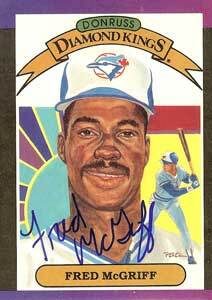 But McGriff’s argument is sort of the opposite of Mattingly’s: At no point was Fred McGriff one of the best players in baseball. He only once managed 30 Win Shares, which is sort of the MVP cutoff point, and he wasn’t an especially good defensive first baseman, and he could not run and so on. To me, if you are going to get to the Hall of Fame entirely on your bat, you need to hit at a historic pace — like Edgar Martinez or Mark McGwire did. McGriff, I think, is a notch or two below Martinez and McGwire. I think he’s probably a notch below his contemporary Will Clark, who did not get much Hall of Fame consideration. Perhaps these writers need to wallow in the nostalgia of the video I have posted below. It contains highlights from Fred’s prime years in Toronto and is narrated by future Ford Frick winner Tom Cheek. 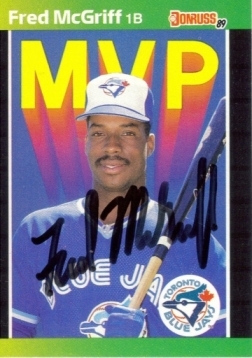 Jays coach at the time, John McClaren, weighs in on Fred’s defensive prowess. McClaren forecasted a Gold Glove in Fred’s future. It never came. If it did, how much would it have helped his HOF chances? Would he no longer be looked at as just a bat? Next articleRemember When Cito Was Runner Up Manager of the Year? It will be hard to compare McGwire (confirmed cheater) to McGriff (supposed or assumed non-cheater). All those walks McGwire got were based partly on his HR hitting potential. I just mean it is apples and oranges now.